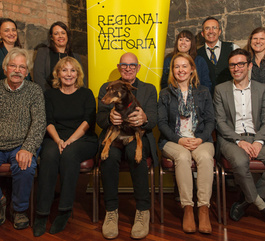 Regional Arts Victoria welcomed two new members to the Board of Directors at our 2018 Annual General Meeting on Saturday 26 May. Helen Healy and Dr Greg Pritchard joined us as Elected Directors, and Elise Armitage and Karen Whitaker-Taylor were also re-elected for a further three years. Helen Healy has spent the majority of her professional life living and working in and from Mildura, and has produced over 300 events in the region and across Australia. Helen has been the recipient of several awards including the Victoria State Government Small Business Regional Hero status, numerous local business and tourism awards, peer assessor for Australia Council and has twice been a finalist in the Australian Event Manager of the Year award. Currently, Helen is an arts and cultural engagement consultant specialising in arts management and troubleshooting, with 20 years’ experience in event management, performance, festival direction and executive roles to inform her work. Helen composes songs, is working on her first novel and is the mother of two talented artists. Dr Greg Pritchard has a long history in regional arts, with a career that includes Cultural Development Officer for Horsham Rural City Council (2005-10), inaugural Regional Arts Development Officer for Western Riverina Arts 2011-13, and Artistic Director for the Regional Arts Australia conference/festival Artlands Dubbo (2013-2016). Greg is currently General Manager of ACT Natimuk, the organisation that runs the cultural program in that small Wimmera Town, including the Nati Frinj Biennale which he co-founded in 1999. Greg is a key Natimuk artists and has created work for every festival. He is also Creative Producer of Poppet, a large celebratory performance for the Regional Centre for Culture program in Bendigo in October 2018. Greg is a writer, performer, and conceptual artist, and has created work in Australia, Asia, and Africa. Regional Arts Victoria also farewelled long-serving Directors Martin Paten and Peter Giddings in May, both of whom reached their maximum terms of nine years with the Board. Both made significant contributions to the work of Regional Arts Victoria and will continue to be called upon for advice and guidance from our team. The 2017 Annual Report is now available for viewing. Image: The Board of Directors with Sammie the dog and CEO Joe Toohey at the 2018 Annual General Meeting. Photo by Snehargho Ghosh. Regional Arts Victoria welcomes two new members to its Board of Directors.